Rhyl Folk and Acoustic – 6th. June – A Milestone Birthday. 6th. June – A Milestone Birthday. 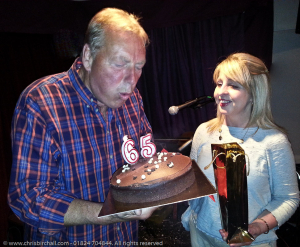 Long time member Kevin Wardman was enjoying a special birthday this week and the club presented him a cake and bottle of Vin Rouge to celebrate. Kevin (Mr Consistency) has been entertaining the club since the far off days at ‘The Bee’ and is without doubt one of it’s most popular members, Happy Birthday Kevin. Also we had ‘newbey’ Stephen popping in from Ruthin, Wendy sang a trilogy homage to the world wars to mark D-Day they were followed by Tom & Linda, Richard, Martin on his Takamine and M.C. Chris remarked “One day we may get a guy called Takamine playing a Martin“, Young Brandon next, who also won the raffle bottle, Tony Grant who was peeved at not attending last week on his birthday, therefore surrendering his right to a cake. But it was Linda that brought the house down with her Kazoo dexterity on Gerry Rafferty’s Baker Street, supported by Tom& Richard….Brilliant! M.C. Chris ‘B’ saying now we know why it’s known as ‘The Happy Club’.